It was a big week for two very different video games in Japan. 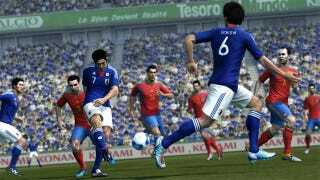 One, Konami's World Soccer Winning Eleven 2012 (a series you may know as Pro Evo), topped the charts overseas, selling more than a quarter million copies in its first week. The other, AKB1/48: Idol to Guam to Koishitara..., the dating simulation that lets you canoodle with one of the girls from Japanese pop group AKB48, also did quite well, selling more than 236,000 copies to PSP owners in search of romance. From there, things quickly drop off, with F1 2011 in third at a little more than 25,000 copies. It's still more than twice what id Software's Rage sold on the PS3. The first-person shooter debuted with 11,000 copies sold on Sony's console, another 7800 on the Xbox 360. Take a look at the top 20 bestselling video games in Japan for the week of October 3 to 9, courtesy of Media Create, and see if you spot any surprises. In Japan's video game hardware contest, the Nintendo 3DS once again comes out on top, even with no software representation in the top 10. Also of note, it looks like Media Create finally stopped counting PSP go sales, which have been in the single digits. Rest in peace, PSP go.